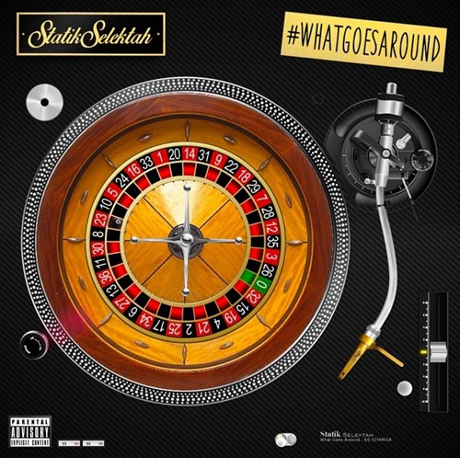 After already having issued teases featuring Action Bronson, Joey Bada$$ and Freddie Gibbs, New York producer Statik Selektah has revealed his upcoming What Goes Around LP will also feature guest bars from the likes of Ab-Soul, Snoop Dogg, Talib Kweli and more. While it had already been reported that the record drops August 19 through Show Off/Duck Down, the recently delivered tracklisting now confirms that Selektah's latest features 20 new, guest-loaded tracks. This includes the previously previewed "The Imperial" with Action Bronson, Royce Da 5'9" and the Roots' Black Thought, as well as the Bada$$ and Freddie Gibbs-assisted "Carry On." Bronson also appear on the set's "Long Time," while Bada$$ returns later on in the set on "Slum Villain." The latter's Pro Era crew pals CJ Fly and NYCk Caution show up on "My Time," while fellow Beast Coaster Dessy Hinds pops up alongside Astro on "Rise Above." Elsewhere, you've got features from Snoop Dogg ("All the Way [Pimp Hop]"), Duck Down's Sean Price and Rock reteaming as Heltah Skeltah on the self-referential ("Heltah Selektah"), and Talib Kweli tag-teaming "The Thrill Is Back" with Styles P. Also appearing on What Goes Around are Ab-Soul, Sheek Louch, Pharoahe Monch, Dilated Peoples, Cypress Hill's B-Real, Noreaga, De La Soul spitter POS, Bun B and more. You'll find the detailed tracklisting down below.